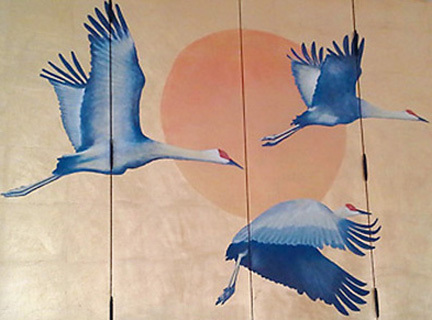 The placement of the cranes and sun, the colors, and even such details as the"personality" of the crane's feet, were carefully considered, scrutinized and discussed with the team from Drisko Studio Architects, Paul Davidson Incorporated and The Briggs Residence. Samples were developed in the studio, and decisions were made collaboratively. West Adams District, Los Angeles, Ca. To see more of this project click link below.